Recently, more and more iPhone users complain about HEIC images and want to convert these HEIC files to other viewable formats without restriction of enjoying all HEIC images on any non-iOS 11 operating system, like android devices, Windows computer, and other related devices. Are you also tired of HEIC images from Apple's new iOS 11? Have you looked for various ways to solve this annoying problem? Now, diverse converters are released in market. What is certain is that facing with different kinds of converters, you will get into a trouble that how to make a wise decision and choose a suitable one. If you are interested in finding a practical tool to achieve conversion with high efficiency, this review is of great help by introducing the following best 3 HEIC to JPG Converters that are well-known and popular through different aspects, such as interfaces, functions, performances. As an all-in-one HEIC converter, Joyoshare HEIC Converter provides you with a professional platform from which you can get a big surprise. With a clean interface, not only can it convert HEIC images to JPG, but also it can offer you more attractive output formats, including PNG, BMP, GIF, TIFF, and WEBP. It enables you to finish the whole conversion process within just several seconds. 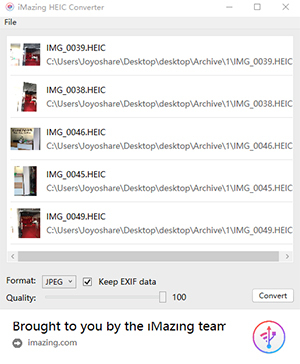 Considering multiple HEIC images will need to be converted at the same time, Joyoshare HEIC Converter can support conversion in batch aside from the common conversion way, converting single photo at a time. What's more, it is well developed to adjust output parameters and choose output format. What are special points of Joyoshare HEIC Converter is that you can tick three options, outputting all images, keeping aspect ratio or keeping Exif information. The most important thing is that when you use Joyoshare HEIC Converter, your private information will be protected well without uploading it into iCloud. Supported OS: Windows XP/Vista/7/8/10 (Windows version); Mac OS X 10.8, 10.9, 10.10, 10.11, 10.12 Sierra and 10.13 High Sierra (Mac version). 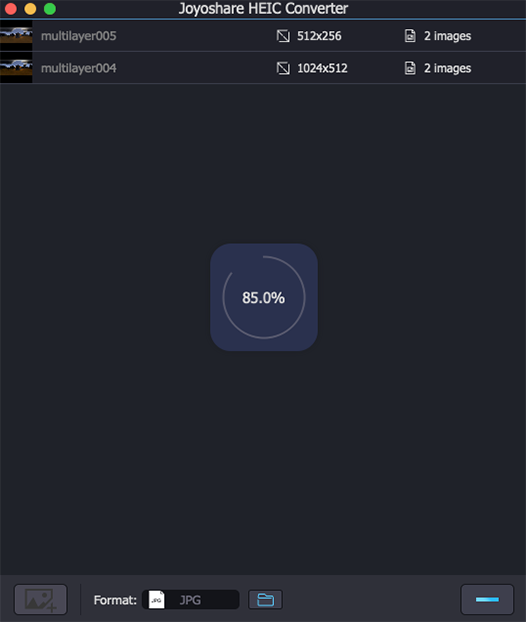 iMyFone HEIC Converter is a free PC application well designed to convert HEIC images to JPG, the most popular format that is compatible with majority of platforms. With a tiny interface, you can know how to use iMyFone HEIC Converter without referring to in-depth guide. By dragging and dropping HEIC files, the conversion can be done through two ways, converting single file at a time or converting plenty of files of folders in batch. After conversion, you will see that the output images are lossless and keep the original quality. What needs to mention is that iMyFone HEIC Converter is safer than other online converters. The reason is that it converts HEIC images to JPG locally without privacy leak. In addition, with advanced processing core, it can finish conversion within less than 1 second, which is faster than other converters. iMazing HEIC Converter is a free and simple desktop software which is developed to convert HEIC images to both JPG and PNG format. With iMazing HEIC Converter, you can adopt Apple's brand new format without worrying about compatibility with your older software. Thanks to its clean home interface, it's clear for you to drag and drop files or folders into converter directly. iMazing HEIC Converter can Support for color profiles, including wide-gamut. During the operating process, you can slide the button from the left end to the right end to adjust the converted photo quality. Besides, you can keep the EXIF information. It is really easy- to-use converter without complicated operation. Which HEIC to JPG converter is best? To decide which one to pick up, you need to be clear about your own needs. 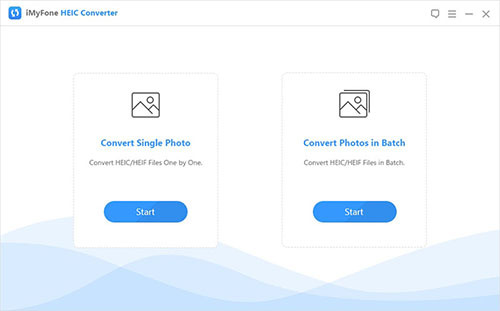 If you want to convert HEIC images with more output format and customize the one based on your way, it's better for you to choose Joyoshare HEIC Converter, which is an all-functional converter tool. If you would like to only convert HEIC images to JPG and unwilling to pay for it, iMyFone HEIC Converter is a good choice, which can convert files in a fast way. However, iMazing HEIC Converter can help you to keep EXIF metadata when compare to iMyFone HEIC Converter, which is free of charge too. Don't hesitate to try it now!